Shortly after the advertisement of a screenless Zen Stone, which we have reviewed earlier, Creative has announced the release of an improved model - Zen Stone Plus. It is equipped with a small monochrome OLED display. As we may recall, the previous model has definitely made a positive impression. Let's see how the next version of the product has turned out. Creative has been present on the audio player market for quite some time. Some of the models it has produced can now be found in the archives. Yet it still keeps on releasing novelties. For the most part they are audio players that conform to a certain common concept. For example in their computer interface, menu system (that was patented, by the way), file navigation and other parameters. However, among the ranks of modern Creative products there are some that stand out - such are, for example, Zen Nano Plus and the model we are going to examine in this article. They have a lot in common, and we shall run into that fact many times along the way. Let us begin our review. As one can tell from the pictures the Stone Plus and the newer model have identical design. The difference is that the once-empty space on the surface is now occupied by a small round display. As before, the front panel contains a circular 4-way directional pad with another transparent button in the center of it. The bottom face houses a mini-USB port for communicating with a PC and a Reset button. The top face is occupied by an impressed indication light, built-in microphone opening and two more buttons joined into a rocking button. One turns the audio player on and pauses playback (which is standard), while the other one is a customizable button for quick-launching a certain function. The player is switched on by pressing down and holding the Play button on the top face. The button has to remain pressed down for a while. After that one has to wait some more until the greeting messages disappear. As a result, the total startup time until the player is ready for playback ends up being 10-11 seconds. This sad fact prepares us for the rest of the sluggishness in the operation of this player. Unfortunately, we run into the same situation repeatedly while navigating through Stone Plus' menus. Also, at that point the similarities with Nano Plus start to appear. Both models are very slow in responding with an action to a user pressing the buttons. This is annoying, frankly speaking. Besides, it sometimes results in confusion if a user tries to quickly get to a certain menu option while the player is still processing previous commands and is not responding to the buttons being pressed. It must be admitted that when the playback is stopped navigation goes a bit faster. However, the lag is still noticeable. In that regard (and some others) the player is like the Nano that was released several years earlier. Yet after all that time nothing about it has changed. The manufacturer has probably decided to maximize its savings on the player's internal electronics. The tiny display utilizes OLED technology. It is monochrome, which makes it contrasting enough so that messages are easily readable despite the small font. Display contrast is adjustable. Although the player and the screen are miniaturized, the menu is not deprived in settings. One can choose the current time, date and day of the week to be simultaneously displayed as a backdrop. The customizable button that we have mentioned above can be set to showing the backdrop, turning on the voice recorder or the stopwatch according to user's liking. Display backlight turns off after a specifiable time. After that one may run into an unpleasant situation - every time a button is pressed it will have to be pressed again, because the first time it only turns the light back on. There are only to choices here - get used to it or don't turn the light off. A file browser as such is missing. Folders can be navigated with their names being displayed, but it isn't possible to see the files inside each one. After a folder is selected the playback begins with the first song in it. Advancing to another folder is likewise slow. This is rather inconvenient and is only a little better than not having a screen at all and being able to jump to the next folder like with the previous Stone model. The folders themselves can't be opened, while the subfolders are displayed at once in a big list together with their parent folders. If a folder contains no files, but rather another folder with music inside only the name of the one containing music will be shown. Unfortunately, such twists don't exactly add to the ease of use. Quite a lot of information is shown on the screen during playback. Playback mode, equalizer indicator, equalizer-independent bass boost indicator, battery charge status, track timer (elapsed time), track title and progress bar below - all fit onto the tiny display. Track title, though, is clearly a problem area for Zen Stone Plus, in similarity to Zen Nano Plus. Only the title of the song is shown, but not the artist name, let alone the album name. The player is capable of displaying non-English alphabets only if the tags are in Unicode, otherwise song titles will appear garbled. The quality of audio output is comparable to that of the other Zen models. In contrast to the previous Stone model, the new one allows to enhance the sound with an equalizer. Standard presets are included: Rock, Jazz, Classical, Pop. One five-channel custom preset can be defined by the user. As we have noted above, bass boost is enabled separately. The player has a variety of playback modes. There are eight of them: repeat a track, repeat all tracks, repeat all tracks in a folder, play a track once, repeat all tracks after shuffle, shuffle and play once, and shuffle within a folder. The results of an objective audio channel test that were performed using RMAA 6 follow. Let's focus on the formats. Only the widely-spread are supported - MP3 (at 320 Kbit/s) of course, WMA (at the same bit rate), and WMA protected against illegal replication by DRM 9 technology. Files of the latter format will be available only if you transfer them from a computer using brand Creative Media Lite software. We have noticed that the player saves audio recorded with built-in microphone in WAV files in a special folder. After we had placed a few "alien" tracks in IMA ADPCM format with original titles in this folder, the player has successfully opened them without hesitation. Although it has failed to recognize the tags. There is one drawback to this method - whereas in the regular mode the list of files isn't displayed, this one also prevents the folders from being viewed. So the music has to be sought by means of trial and error. Of course, it is unlikely that anyone will rely on this abnormal method. Although, the regular navigation scheme is not much easier to use. Whereas the previous Stone was only capable of playing music, Stone Plus isn't short of the functionality standard for contemporary flash-players. First, it has a FM-radio. Its memory is capable of storing up to 32 stations. You can't specify a name for each one - this function is not included for obvious reasons. Naturally, auto-preset function is available. The quality of reception is standard and depends mostly on the power of the transmitter and the surrounding landscape. In similarity to the other latest Creative player models, there is no ability to record audio from the radio signal. We can argue about the correctness and logic of such design, but, alas, can not change it. Player manufacturers strive to equip every model with a voice recorder, more specifically, a built-in microphone regardless of the quality. Some manage to provide a decent functionality, which is very useful in practice. The others, as is the case with Stone Plus, come closer to a mediocre one. While it is operational and actually records sound from the built-in microphone, it can't be used for serious purposes. The audio comes out muffled and that's the end of it. Nevertheless, the model positions itself as low-cost and not as a part of the high-end series. Therefore, we can't blame it for mediocrity. The maximum duration of recording is ten hours, which should, in principle, be enough (unless you are a spy, of course). No quality settings are provided. Audio is recorded in IMA ADPCM (WAV) format with a sampling rate of 8 KHz and a bit rate of 32 Kbit/s. All saved files are available from a single Recordings menu. An additional feature of Zen Stone Plus is a stopwatch. Ability to store several lap times in memory is not provided. One can only stop or start the time measurement again. The function is implemented in an original fashion. The numbers on the screen are split into four quadrants. The upper one is occupied by the hours, the lower one shows the minutes with the seconds also running below. Sportsmen are going to welcome this extra feature. We have already mentioned Creative Media Lite program in this article. It has also been described before in our Zen Stone review. It provides ability to limit the player's maximum volume, to convert music CDs, to update the player's firmware, and, of course, for transferring music files from the player to a computer. The player's package doesn't include any disks with software. Instead Creative offers this program on the official web-site for downloading. They could have stored it in the player's memory, which many other manufacturers of flash drives do nowadays. Old operating systems are apparently not supported, because only WinXP SP2 and Vista support is listed on the web-site. If we connect the player to a WinXP computer no additional drivers are needed, because the device is identified as a removable drive. This means that you don't have to download and use Media Lite. It is only necessary for handling WMA files protected with DRM technology. Any file manager will work for transferring music, including Windows Explorer. Honestly, the rate of transfer is disappointing. It averages one megabyte per second, same as with the previous Stone. Considering that the player has 2 GB of memory (there are no other variations), it will take considerable time to completely fill it. Zen Stone Plus is advertised as a budget model. Due to that the package is reduced to a minimum. The small box contains a stack of mini-manuals in various languages. It is so skillfully and tightly packed that it looks like a message in bottle from a wrecked ship. Creative headphones standard for all Zen players are also included. In addition, the package contains a short (~13 cm) USB- miniUSB cable for connecting to a computer. The player's surface is easily scratched even if used carefully. In this sense Stone Plus, Zen Nano Plus and the previous Stone are very much alike. All three are made of the same plastic, which feels very thin by touch. In this regard, it is necessary to look for accessories, which Creative has promised to provide while advertising. On one of Creative web-sites we have also found a wrist-band that allows wearing the player like a watch. The player is charged using a computer's USB port or a brand charger. There is information on discussion boards that non-brand devices, for example Motorola cell phone chargers, can also be used, although we haven't tried to do so ourselves. Power is supplied by a built-in Li-Ion battery. 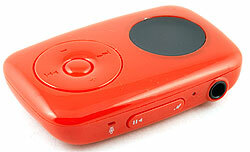 Notably, its capacity is quite enough for seven to eight hours of music playback of decent quality (256-320 Kbit/s). Of course, in comparison to many other players this is not much, but we should take into account not only the player's low cost but also its small size. Beyond any doubt, Creative Zen Stone Plus is a rightful addition to the budget Stone series. The series so far consists of two modifications - the one we have examined in this article and an earlier one. Frankly speaking, the new model has left quite a few negative impressions. First of all, it is very slow in operation of its internal software and in communicating with a computer. Sure, you can get used to it, but there are other models by various manufacturers out on the market that don't have such shortcomings. Nevertheless, Zen Stone Plus has two key advantages over them, and in most cases they are critical when choosing a player. One is the famous brand name, and the other is the low retail price for a model with 2 GB of memory.